The Kennedy Plaza in atlantic City can be found on the Boardwalk at the end of South Mississippi Avenue, opposite the Trump Plaza Casino Hotel. The Plaza hosts a miniature golf course and also an outdoor theatre. The Kennedy Plaza outdoor amphitheater is set-up in the style of a Roman Colosseum, with magnificent columns lining the courtyard and surrounding steps that provide a great viewing experience. During the summer there are regular shows and movies on offer at the Kennedy Plaza. The shows are often of very high quality and the remarkable thing is, that they are almost always free to the public. Recent shows include many forms of dance - from Latin through to break-dance and even Korean marching bands have entered the stage! You will also regularly see bands and groups, singing and playing at the Kennedy. Again, the variety on offer is fantastic - classic guitar, rock, folk jazz and even Hawaiian Luau entertainment with Hulu girls! In summary, there is always something great to see at The Kennedy Plaza, especially in season, so it is well worth checking out. Especially as the shows are more than often free. 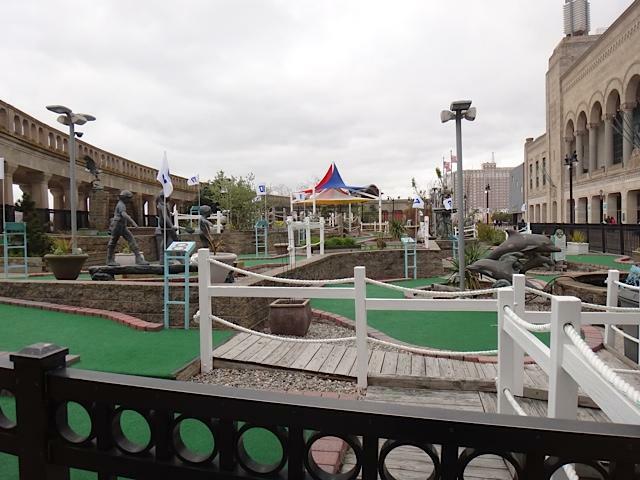 One of the more popular attractions in Atlantic City is the miniature gold course at Kennedy Plaza. It is popular with both old and young and also with families, providing fun and amusement for everyone. the course if good, as you would expect, with plenty of variety, interesting obstacles and contours to navigate. Not many miniature gold courses offer the views that you get on Atlantic City Boardwalk, so it too is definitely worth a visit.